We are looking forward to hosting the first collaboration between Crafted Kitchen members Hank and Bean and GrowGood's Director of Culinary Programs, Eric Tomassini for an Urban Farm to Table Dining Experience. Ticket proceeds help GrowGood's ongoing mission to serve and support our veteran and shelter community. Join us for cocktails and a five course tasting menu curated by Chefs Henry Fischer and Anna Rose Hopkins of Hank and Bean. All produce will be harvested from local LA farms! The meal will begin with craft cocktails by Sourced Craft Cocktails. and will finish with sweet treats from Hebel & Co.
Help GrowGood finish their greenhouse, creating more jobs and provide food and therapy for those in need. 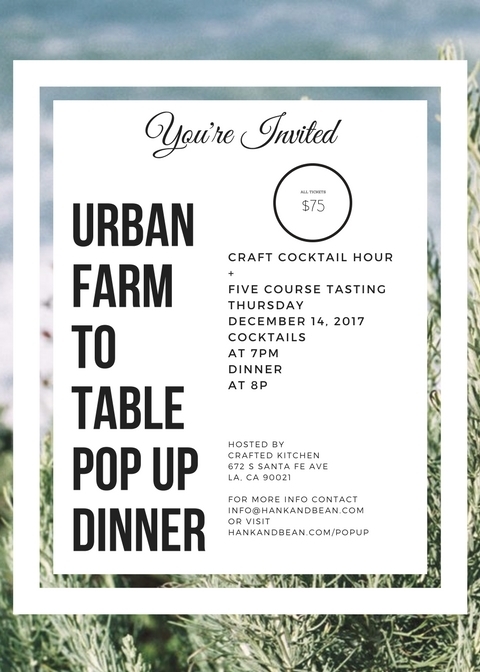 Your participation in this URBAN FARM TO TABLE DINNER will have a direct impact this holiday season. Meet the chefs! Here's Hank and Bean's Co-Founder Anna Hopkins on not doing business as usual. What were you doing before you started Hank & Bean? I was focused on a version of this bespoke private chef service first in NY then in LA, and Henry was exec chef at Animal Group (Son of a Gun Restaurant) in Beverly Hills. What is one item you would like to take off your menu but can't? Beef. And Salmon aka "The Beef of the Sea" We have set a goal for our business of 70/30 protein usage - so we are creating a balance of 70% plant based to 30% meat protein across the board. And then of that 30%, we use beef and salmon only by request or for targeted nutritional purposes. We're committed NOT to do business as usual, even through our humble beginning. For instance, when providing 300+ Paleo meals weekly for a third party purveyor this year, we limited our use of beef to one in five meals rotating weekly. And we pushed for non-gmo / antibiotic free beef. But this doesn't begin to address the issue of methane gas produced by our national addiction. And the conversation around salmon tracks. How can we taste your healthy meals? We currently provide a bespoke private chef, catering and event service while in development on a broader reaching meal prep service. Look for the more consumer friendly version of all services by Spring 2017. Also, we are actively exploring options for a brick and mortar home and will begin a pop up series in efforts to develop our menu while bringing community together. We would love for you to join our first pop-up dinner on December 14th at Crafted Kitchen!